At Be Wise Occupational Health, LLC, we are dedicated to promoting healthy, safe, and drug-free workplaces by providing high quality occupational health care services. Contact Dr. Breznay today to learn how she can meet your occupational health care needs in our office or at your work site -- whichever is best for you! Dr. Breznay can also help you to determine whether or not a potential employee is physically able to perform the essential functions of their jobs. Let Dr. Breznay teach your employees proper ergonomics for sitting at desks, lifting heavy objects, and working on assembly lines as well as provide you with back care tips to keep commercial drivers in tip-top shape. We can also provide you with nutritional planning and counseling to help keep your workplace healthy! 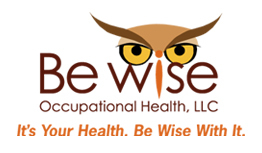 Be Wise Occupational Health, LLC serves as a collection site for many third-party administrators (TPAs) and labs. Serving your company in this role, Dr. Breznay can perform drug and alcohol tests for a host of reasons such as employment related areas (pre-hire, random, reasonable suspicion, and post-accident), personal, or legal reasons. Our services, which include 5-panel standard drug testing (a medical review officer (MRO) is included with the DOT test) and breath alcohol testing, can be performed at your site or our office. At Breznay Family Chiropractic, we offer a variety of services to meet your health care needs. Listed below is an overview of how we can help you. Be sure to ask about our emergency in-home visits, pregnancy pain treatment plans, and nutrition and diet advice!